Rigid, Soft, Day & Night, Large or Small: We expertly fit all these contact lenses types. A customised corneal rigid lens for a patient with keratoconus, viewed under green light. Bay Eye Care are experts in the fitting and management of all contact lens types. Bay Eye Care is the ideal practice if you need specialty contact lenses to see clearer due to a serious corneal disease like keratoconus, pellucid marginal degeneration, a high prescription or a corneal graft. We also help general contact lenses wearers who prefer not to wear glasses throughout the day. Because Bay Eye Care is a specialty contact lens practice we have access to the Ministry of Health Contact Lens Subsidy for patients who, for medical reasons, cannot wear spectacles to see effectively. This partial subsidy contributes a portion of the costs associated with the fitting and supply of contact lenses from Bay Eye Care if you meet certain criteria. Your lifestyle, occupation and visual requirements. These lenses are worn throughout the day, typically come in a daily and monthly replacement variety and can correct a large range of prescriptions. An OCT scan showing a scleral rigid lens fitting over a patient with a central corneal scar. You can see the contact lens does not touch the eye in this location. A modern scleral contact lens with it's unique 4 letter laser engraving for indentification and checking parameters. Corneal rigid lenses: These lenses are a small diameter and sit on the cornea (clear window at the front of your eye) during wear. Scleral lenses: These lenses are larger and rest on the conjunctiva (white of the eye), with a reservoir of tears between the lens and the cornea. This makes these lenses ideal for very irregular eyes and patients with severe dry eye. Scleral tend to be more comfortable than the smaller corneal lenses, but take more practice to learn how to use them. An orthokeratology lens to correct astigmatism, viewed under green light. These lenses are worn only when you sleep. They reshape the front surface of your eye so that when the lenses are removed you can see clearly throughout the day. They can correct a range of prescriptions and last for one year in most cases. Orthokeratology lenses are especially useful to slow the progression of short-sightedness in children and to decrease the dependence on reading glasses as we get older. For more information about this modality visit our Orthokeratology page. Learn more about Ortho-K vision correction with our introduction video. 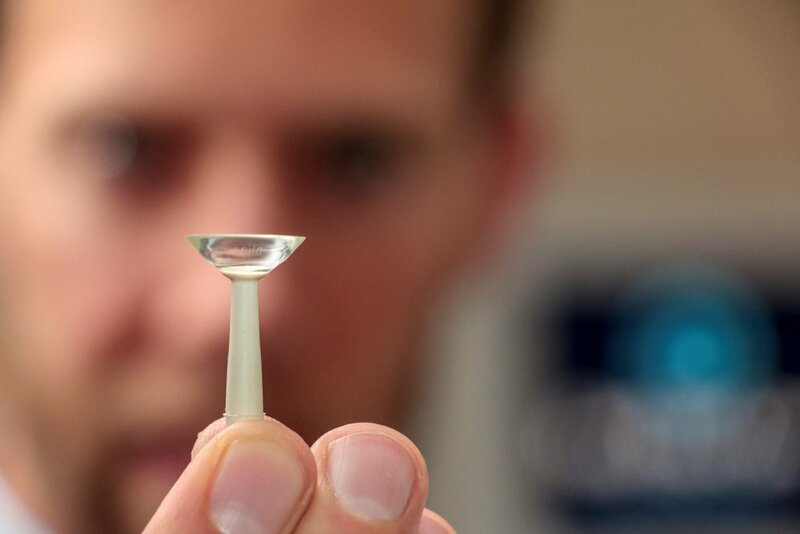 The majority of Bay Eye Care's rigid and Ortho-K lenses are locally manufactured in Christchurch by NZ-based Contact Lens Corporation, and are designed using cutting-edge lens design software Eyespace. Before wearing contact lenses, people usually have a number of questions regarding them and what is involved with being a contact lens wearer. More information about contact lenses can be viewed here: Bay Eye Care's General Contact Lens Information Sheet. Watch Bay Eye Care optometrist Mr Alex Petty demonstrate how to insert a modern scleral contact lens. Our optometrist Mr Alex Petty is a contact lens specialist and has years of experience with fitting contact lenses and training patients how to use their lenses safely and successfully. Because all contact lenses are medical devices it is essential that there are no shortcuts in the fitting process or there is an increased risk of problems arising. All contact lens wearers should be reviewed every 12 months to ensure their eyes remain healthy. At the recommendation of your optometrist some patients are reviewed more frequently that this. A graphical representation of the eye shape of a patient with astigmatism. Information like this is crucial when we design customised contact lenses at Bay Eye Care. At Bay Eye Care we use a range of cutting-edge equipment to assist us with fitting contact lenses to your eyes. This technology includes measuring the shape of your eye, scanning the layers of the contact lens on your cornea, digitally imaging the fit of a contact lens on your eye and designing custom lens designs with this data using simulation software EyeSpace. For an indication of what it may cost you to have contact lenses professionally fitted at our practice visit the Bay Eye Care Fee Structure page. Our corneal topographer device: used to accurately measure the shape of your eye for contact lens fitting.